We value your customers and are passionate about pedestrian safety on the roads. Every Dog Moda customer receives a small but functional present. Every collar and lead bought from our website comes with a free reflective dangler designed to increase visibility and safety at night during walks. Reflective on both sides and made of high visibility prismatic PVC our danglers reflect light in the path of oncoming vehicles. Attached to your dog's collar, lead or your own clothes reflective dog tags instantly make you more visible to oncoming traffic from as far as 300m away. We feel strongly about pedestrian safety and the use of reflective collar tags and clothes in the dark to enhance your own and you dog's visibility to oncoming traffic. 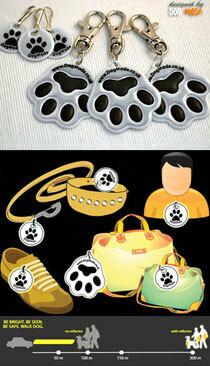 We also stock reflective dog collars, collar tags and snoods. All purchases from Dog Moda website come with a FREE reflective dog collar tag to promote and encourage the importance of using reflective products for safe road use at night. For more information about this product and to buy additional reflective danglers, please go to their product page. Thank you for your custom and stay safe in the dark!